Cindy Carlisle, a 2017 candidate for Boulder City Council and a former Council member, has played a tangible role in creating some of the Boulder we know today, and wants to participate once again to help make sure overdevelopment and deep-pocketed political interests don’t render her past efforts for naught. “I’m running because I believe there’s a clear choice in this election, between traditional progressive values and trust in government, and on the other hand, big money and dwindling trust in government…I’d like to see if we can’t manage the inevitable building and congestion in a way that people don’t feel displaced from their own community,” said Carlisle. Carlisle was born in Florida, but she was from a military family so they moved several times during her childhood. Her father was a pilot with the Air Force and involved with military policy, and he met her mother in Hawaii where Carlisle spent several years of her childhood. “It (Hawaii) gave me a good sense of what a multicultural place can be like. I still have great love for the islands and the people there,” said Carlisle. Her family also lived on the East Coast and in the South before they moved to Colorado Springs when Carlisle was 11 years old, and her father was part of the North American Aerospace Defense Command (NORAD). She attended a small Colorado Springs public school for four years, but visited Boulder for football games and other events and, in her words, “loved Boulder from an early age.” She started college at Ohio State University, but finished her undergraduate degree at the University of Colorado-Boulder—and continued at CU to earn a Master’s degree in English Literature, take doctoral level courses, and teach composition courses. However, Carlisle was also raising a family, and when she became pregnant with her second child, she decided she “wasn’t really Superwoman” and took time off to be at home with her children. But since she wasn’t devoting so many hours to work and study, she found time to become involved with neighborhood activism in her West Pearl area. In her opinion, development was affecting the neighborhood character, including businesses moving into the residential area, and increasing density when a former Council and Planning Board member added what she called “illegal Accessory Dwelling Units (ADU)” in already dense housing projects. “So, it doubled the population, the cars, and the impact on the neighborhood. These are the kinds of things that don’t really go away, as people see self-interest in politics again and again,” said Carlisle. The neighborhood involvement helped stop the incursion of business into the residential area, though not the ADUs. It also helped lead to Carlisle’s first run for Council in the 1985 election, and she earned a four-year term to serve from 1986-90. According to Carlisle, the Council at that time decided to take a “very environmental tack,” including transportation improvements that could easily be taken for granted today. Carlisle chaired an ad hoc Transportation Master Plan committee, which met for more than two years, and the discussions led to action regarding facilitating alternative modes on city streets; creating north-south and east-west bike routes through the city; establishing the HOP, SKIP, and JUMP bus lines; and undergrounding College Avenue at Broadway. Carlisle submitted an ordinance and worked with a city engineer on an effort to establish Boulder’s Tributary Greenways program, with a master plan adopted in 1990. It included plans to start from the Boulder Creek Path, which Carlisle said was not as long as it is today, and branch new trails out along the creek’s tributaries. Carlisle was elected to a six-year term on the University of Colorado Board of Regents in 2002. While with the Regents, she worked on environmental issues with students and administrators, and was a founding member of the Energy and Environmental Security Initiative—in short devoted to researching and disseminating information about the impacts of policy on a sustainable energy future. She was on the founding board of New Era Colorado, the youth voting advocacy organization, and supported making Folsom Field into the nation’s first “green” stadium with zero-waste practices. She also cast two highly publicized votes—against Bruce Benson becoming CU’s President, and against firing the controversial former CU professor Ward Churchill, saying her vote was meant to support a recommendation of CU’s Privilege and Tenure Committee to instead suspend him for a year and demote him. 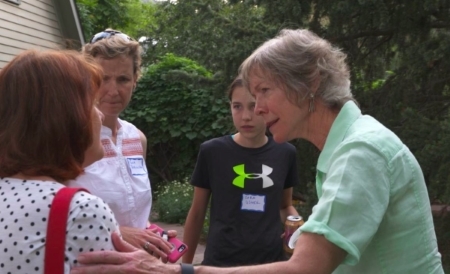 She has also made two unsuccessful runs for office, losing to former Sen. Rollie Heath in a 2008 primary for the Colorado State Senate, and finishing sixth in a race for five Council seats in 2015—behind current Council member Jan Burton by 125 votes (Burton at 8,986 to Carlisle’s 8,861). On to current city issues—Carlisle still supports the city’s efforts to establish a municipal electric utility, noting that she doesn’t believe Boulder will be able to reach its goal of 100% renewable energy by 2030 without the muni. She also said the amount of city money spent to date on the muni effort is “significant,” but isn’t comparable to the profit Xcel Energy makes from operating in Boulder every year. Furthermore, she said the city would gain control over its energy future, and would be able to operate new business or distribution models such as creating microgrids within the city. Regarding growth, she said during her first term the Council looked at optimal growth levels for Boulder, and found studies showing that once a city grows beyond 100,000 people, communities wind up spending more on items such as maintenance and public safety than they receive in amenities. Thanks in part to well-known local slow-growth policies, Boulder’s population was 83,312 in the 1990 census, only growing to 97,385 by 2010 (though estimated at 108,090 for 2016). “I think the city will continue growing, but if we manage growth carefully, we can still try to keep within the limits of having our spending maintain a beautiful and attractive community, as well as fill the potholes—and I know some of those need to be filled,” said Carlisle. To address Boulder’s housing shortage, she favors tackling a long-term jobs-housing imbalance that, in Boulder County, has gained 3.3 new jobs for every new housing unit since 2010. In her opinion, this could include rezoning commercial areas to allow more housing, though she emphasized that she would not favor losing the small businesses and services needed to make a complete community. Like many 2017 candidates, she said the city’s future affordable housing strategy should include efforts to prevent middle-income earners from being priced out of Boulder. Carlisle supports increasing the city’s commercial linkage fee of $12 per square foot, which funds affordable housing programs, to help pay for additional housing units. She also believes the cash-in-lieu contribution developers pay if they don’t build affordable housing on site should be increased, to encourage a more diverse housing stock in new projects, and so more residents will be able to live closer to where they work. “It seems to me that too much affordable housing is being sent to the outskirts, and I really think it should be in central areas,” said Carlisle. Carlisle took part in the city’s Campaign Finance Reform Initiative process, which was designed to keep big money out of Council elections through items such as providing city campaign matching funds with voluntary campaign spending limits. Boulder voters passed the initiative in the 1999 election. She also carried petitions for the initiatives that became Ballot Questions 300 and 301 (neighborhood vote on land use regulation changes; impact fees on new development). While 300 and 301 did not pass, she said they did lead to renewed discussion around linkage fees and—reminiscent of Carlisle as the West Pearl neighborhood activist—about neighbors having a right to have a say in what happens in close vicinity to their homes. “Citizens need to make a difference in our public process. They’re an integral part of the city, they need to have their voices heard, and they need to be a part of how our decisions are made,” said Carlisle. Carlisle is one of five candidates endorsed by PLAN-Boulder County, Together4Boulder, and Greater Gunbarrel. She also has the Sierra Club endorsement. As of Sept. 29, Carlisle had received $100 maximum donations from current Council members Lisa Morzel and Sam Weaver; former Council members Allyn Feinberg, Steve Pomerance, and Gwen Dooley; and current Council candidates John Gerstle and Mirabai Nagle, among others.